“These were not mistakes. These were lies,” Jackson told van der Zwaan as he stood before her. Being able to “write a check and walk away,” she added, would not fit the seriousness of the crime or send the right message. The case has also exposed connections between senior Trump campaign aides, including Rick Gates, and Russia. Just last week, the government disclosed that van der Zwaan and Gates spoke during the 2016 presidential campaign with a man Gates had previously described as having ties to the GRU, Russia’s military intelligence agency. Gates is now cooperating with Mueller. Van der Zwaan, who was fired last year by the high-powered international law firm Skadden, Arps, Slate, Meagher & Flom, admitted in February to lying to federal agents about his contacts with Gates and the person with ties to Russian intelligence. Van der Zwaan had previously grown close to Manafort, Gates and the person, Konstantin Kilimnik, during his work on a 2012 report commissioned by the Ukrainian Ministry of Justice. The report, authored by the law firm, was about the corruption trial of former Ukrainian Prime Minister Yulia Tymoshenko. Kilimnik, who was born in Ukraine while it was a Soviet republic, has previously denied having any relation to Russian intelligence services. Though prosecutors did not take a position on whether van der Zwaan should be locked up, they stressed that he had lied “repeatedly” to investigators. “This is not an isolated instance of bad judgment or criminal conduct,” prosecutor Andrew Weissmann said. Van der Zwaan’s attorneys argued that he had suffered enough already. His life has been destroyed by his “terrible decision” to lie to federal authorities, they said. The attorneys pushed Jackson to allow van der Zwaan to return to London as soon as possible where he lives with his wife, who is going through a difficult pregnancy. 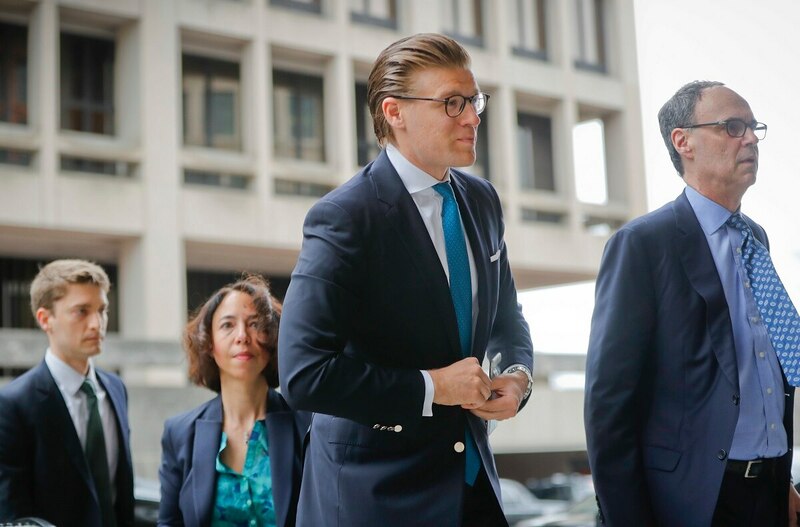 Schwartz stressed that his client had made the effort to return to the U.S. to “correct the record” after he lied to the special counsel’s office, though prosecutors took issue with the characterization, noting that van der Zwaan was under a grand jury subpoena at the time. Jackson said she recognized that van der Zwaan has been away from his family for months, but the defense’s attempts to paint him as a tragic figure didn’t ring true. Jackson also said his signs of remorse were relatively “muted.” He didn’t write a letter to the judge, as his family and friends did, and hasn’t used his time in the U.S. to perform community service or other good deeds to make up for his actions, she said. The sentencing came just hours after another development in the special counsel’s investigation of Manafort, the former Trump campaign chairman. In a court filing late Monday, prosecutors revealed that Deputy Attorney General Rod Rosenstein had in August explicitly authorized the Justice Department’s special counsel to investigate allegations that Manafort colluded with the Russian government. Manafort has challenged Mueller’s authority and asked a judge to dismiss charges against him including acting as an unregistered foreign agent and conspiring to launder tens of millions of dollars he received from his Ukrainian political consulting. He said Mueller overstepped his bounds by charging him for conduct that occurred years before the 2016 presidential election. But in their new filing , prosecutors revealed that Rosenstein — who appointed Mueller — specifically authorized the investigation of any crimes related to payments Manafort received from the Ukrainian government during the tenure of former Ukrainian President Viktor Yanukovych. The description largely captures the charges against him. Rosenstein also empowered Mueller to investigate allegations that Manafort “committed a crime or crimes by colluding with Russian government officials” to interfere with the presidential election. None of the charges Manafort currently faces alleges coordination with the Kremlin. He has pleaded not guilty and denied any wrongdoing related to Russian election interference.